Do you know that in the coming years ecommerce will see sales nearing $2 trillion? Gear up your dreams towards starting an online ecommerce store and be part of the fastest growing and valuable industries. Well, to initially start an online store and run an ecommerce website you have a ready-made solution. 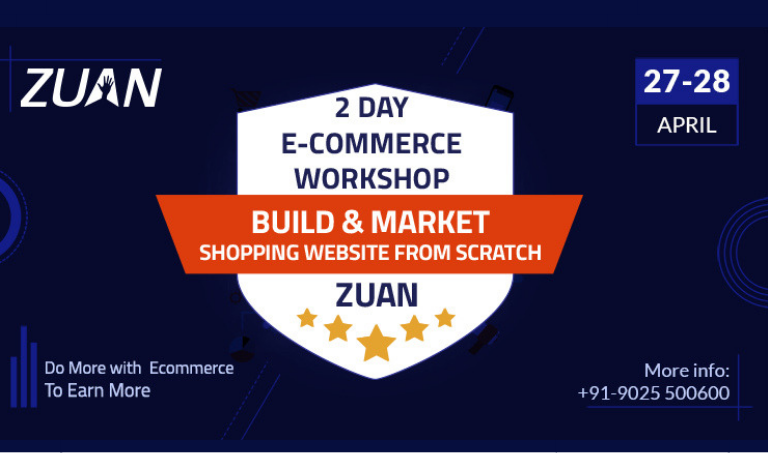 This is offered by experts from Zuan Education, organizing a 2-Day Workshop on the theme, “Build and Market Your eCommerce Website From Scratch”. What Practical Guidance Will Be Given In the 2-Day Workshop? Do you Know how Important Search Engine Optimization is, for your Online eCommerce Store? How to generate traffic or get people to reach your online ecommerce store? The workshop will teach you how to get a good domain name for your online store. Importantly, a good domain name will bring customers to your website. Yes. You need not struggle to find a web developer. Zuan is specialized in building ecommerce stores in a short time and in a professional manner. Payment Gateways and much more. How to Re-Approach Abandoned Carts? How to Integrate Your Online eCommerce Store with Social Media? What is the Importance of Paying Modes like GPay, Paytm and Apple Pay? How to Make a Payment Gateway? What is the Importance of giving Priority to Product Reviews? How to Find a Theme that Matches your eCommerce Vision? What is the Paperwork Involved in Starting a Legitimate Business? How to Take your Business Live? How to Get Media Attention for your Online eCommerce Store? For example, making use of the tool called Helping A Reporter Out (HARO). What is the Importance of PCI Compliant? Factors to Consider while Offering Free Trial versions. If you need answers for all the above facts to start an online ecommerce store you have them all composed in the Zuan’s Workshop. An added advantage will be that if bring your own device such as a laptop, you can practically workout what is taught in the workshop then and there. Walk in on April 27 and 28, 2019 (Sat & Sun) to Zuan Education, New No.61, 2nd Floor, Arcot Road, Kodambakkam, Chennai. To know more you can email at info@zuaneducation.com. You can even Buzz us at 044 – 43 53 4999 and +91- 9025 500 600 . Hurry To Drive Your Dream Big, Earn More and Do Profitable Online Business!